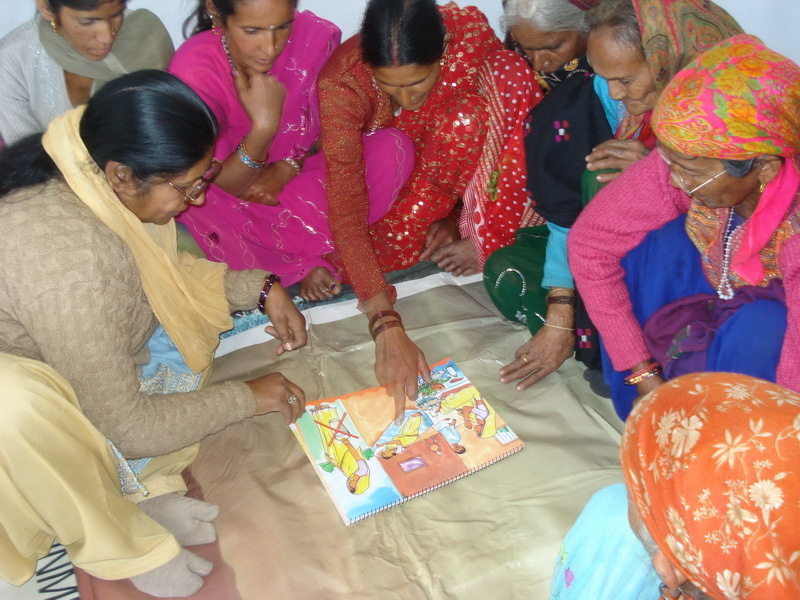 All fifteen of the practicing traditional birth attendants (Dai) of the MGVS working area attended a training workshop on safer delivery practices from March 21st–25th, 2011 at the ANM Centre in Naag Raja Dhar. Permission was obtained by MGVS from Govt. Dr. Rana at the PHC in Chaam to hold the workshop with the help of area Govt. ANMs: Mrs. Mamta Kaushal and Mrs. Pushpa Chauhan. Six Govt ASHA health workers of the area also joined the five-day event, where the MGVS Team worked together with the participants on how to reduce emergency situations and the mother mortality rate in their community. Training was hands-on and participatory: two local pregnant ladies in their ninth month very kindly offered to take turns acting as model patients. A baby doll and a plastic pelvic structure were also used for demonstration, along with numerous other audio and visual aids. The workshop focused on hygiene and infections, risk pregnancies, risks in conducting deliveries away from a hospital as well as assessing risks in time, practical details about getting to the hospital and where to obtain extra gloves in advance of delivery dates etc. The workshop also covered topics related to the health during pregnancy and post natal care of mother and child. The village midwives especially appreciated learning about the physiology of the uterus: Mr. Das is a 75-year old midwife who has been performing deliveries for over 50 years, but like the other women Dais, he had not seen a “map” of the uterus before. The importance of having a birthing place fully prepared before the delivery was discussed by all the participants at great length with MGVS Staff and Kyarda Panchayat pradhan (village council chief) and Chief Guest for the final day of the workshop, Mr. Kirti Dutt Nautiyal. Participants talked enthusiastically about their new understanding of why the birthing place needs to be clean: that it should not be pasted with cow dung, which may contain tetanus, but with clay only, that hot water should be prepared ahead of time for washing hands and arms etc. Delivering babies in a completely different place from the cowshed was also explored by midwives practicing in villages where this is still taking place. Each Dai and ASHA worker was presented with a Dai Kit from MGVS and a certificate at the completion of the workshop. Immunization of children under five has increased from 40% to 70% this year in seven Gram Panchayats (village council areas) of the Naugun Valley and ANC/PNC (Antenatal Care / Postnatal Care) for pregnant mothers have increased from 20% to 60%. Immunization and ANC/ PNC are currently taking place regularly in twelve villages of the area. Govt. ANMs: Mrs. Chauhan and Mrs. Kaushal explained that MGVS assistance has improved villager response to government health services, especially in helping villagers overcome fears about government medical help and vaccines. Villagers are also visiting the ANM centres more frequently as a result. MGVS organized five Mother Child Health Care Days, and four follow-up village visits, together with Govt. ANM and ASHA workers, across the valley from October 6th – November 24th, 2010. Women and children from eleven villages participated in these events, at which check-ups and immunization of children <5yrs, pregnant mothers and adolescent girls are performed. Only thirteen mothers and eleven children attended the first Mother Child Health Care Day, held in their own village: Kyarda. By mid November, however, up to forty-three women and forty-nine children from three and four villages were attending these events. One mother walked three hours from her village Bindalkoti (of the far-off Panchayat: Ghiyakoti) to reach an MGVS Mother Child Health Care Day held at the Gaer Aanganbadi (Govt. Playschool) on November 17th, 2010. Twenty-one more immunization events have taken place in 2011, and at least half of these events were organized by Govt. ANM and ASHA workers, independent of MGVS assistance. 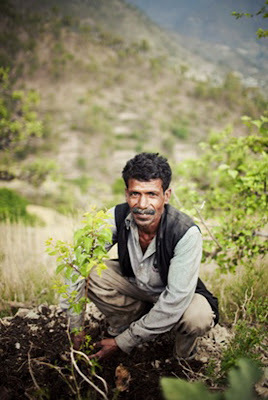 In an effort to increase incomes in the long term, MGVS assisted seventy-seven poor farmers in August, 2010 and February, 2011 in obtaining and planting 604 fruit and nut trees. Trees have been planted in villages: Jamni, Bayaar, Gaer, Ghoan Malla, Ghoan Talla, Lalori, Pokhri, Kyarda, Dadoli, Sensari, Vikol and Ghiyakoti. At the time of planting, MGVS Staff provided training to the fruit tree farmers on how to make a “Thawala” (water-holding funnel-shaped depression in the soil surrounding tree sapling) and the proper spacing and planting/care of fruit trees. MGVS also provided pruning training to the farmers in April, 2011. Trees planted in the monsoon include mango, sweet lime, orange, lime, guava, jackfruit, pomegranate, maalta, grape vines, leechi and papaya. Trees planted in the winter include apricot, plum, peach, walnut and apple. Mr. Chattar Singh of Village Jamni is the most enthusiastic of the fruit tree farmers. In May, 2011, 24 of his saplings were doing well, and in August of this year, he planted twelve new saplings, when MGVS assisted seventy-one poor farmers, in obtaining and planting 441 more fruit trees.